Make some power with Wiseco Racers Choice GP-Series piston kits. Racers Choice GP-Series pistons are forged to be tough and durable to stand up to the abuse of high performance applications. With their CNC-machined high-silicon aluminum alloy, Electra coating, removed boost ports, and high performance rings, your performance is optimized. 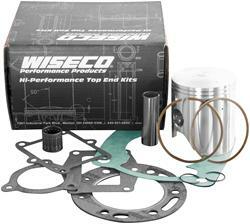 Get Wiseco Racers Choice GP-Series piston kits to be the driving force in your powersports performance.